Children who have had the opportunity of a good a pre-school education settle into primary school well and find the curriculum in primary school a continuation of what they have experienced in nursery. In many instances you will find that your child has developed both socially and academically. There is a growing need for full time day care and parents need to know that their children are in a safe, caring, loving and stimulating environment where all their needs will be met and where their children will be happy. We are committed to providing this. To provide a warm, happy and safe environment for all children in our care. To provide a broad balance of relevant activities that will enhance a child’s knowledge and development. To provide an environment rich in experience, where children will learn to question, investigate and discuss, thus developing an understanding of the world. To provide the basis from which a child can develop a tolerant and understanding attitude towards each other, e.g. sharing and co-operation. To record and monitor a child’s development thus enabling staff to evaluate and meet the needs of every individual child. To provide the basis from which a child can develop a sense of self-respect through the acquisition of self-confidence, self-discipline, self-responsibility and self-awareness. To provide a sensitive and positive approach between parents and staff. To meet all local authority requirements and strive to maintain our high standards of care. To meet Ofsted requirements, maintaining our high standards, confidentiality, health and safety. Our Staff are carefully chosen for their caring natures and for their first hand experience with children.Our team consists of a dedicated Nursery Manager, assisted by nursery professionals who hold a wealth of qualifications.Continuous staff training ensures everyone is able to carry out their duties in a competent and professional manner. 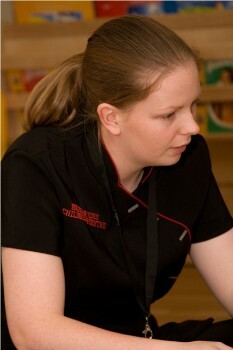 We also work closely with the Bishop Auckland Technical College, training nursery nurse students. We seek, through a balanced curriculum, to encourage your child to develop emotionally and intellectually to their fullest potential, providing each child with a sound foundation for their formal education. All meals are provided by fully qualified cooks dedicated to providing a balanced diet. There is always a vegetarian alternative and provision is made for special dietary needs.